What is Grammarly? - Unbiased Grammarly Review! What is Grammarly? – Unbiased Grammarly Review! What is Grammarly? 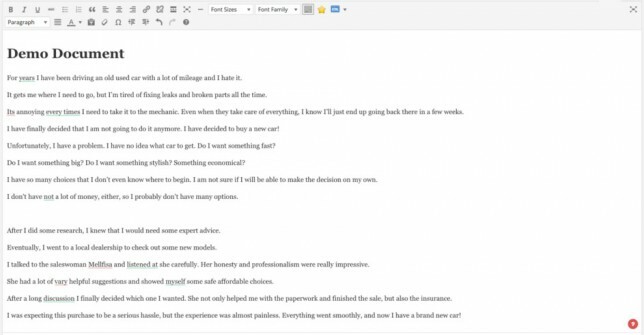 – Unbiased Review of the best free on-the-go grammar checker! How does Grammarly work? Read Grammarly Review here! Overview: Founded in 2008 by Alex Shevchenko and Max Lytvyn, Grammarly has grown to become one of the most successful Internet Startups. Grammarly is selected as a winner of the 2013 Red Herring Top 100 North America award. Its Facebook followers have exploded to over 5 million people. What is Grammarly? – Free grammar checker tool online! I was introduced to Grammarly by a blogger friend at Wealthy Affiliate University as I have been very inefficient in article writing due to my poor grammar. I always start writing my blog articles in WordPress editor and then I copy and paste my completed article to Microsoft Words to perform Grammar and Spell Check in the end. For each mistake I found, I go back to my WordPress editor to correct the mistake. I could do it the other way by writing in Microsoft Words and copy and paste to my WordPress editor, but I have to spend time formatting the article to the right alignment and spacing. In any case, both ways require the copy, paste, check, correct and edit steps that I would have to perform a least a few times for my article before I publish it. Immediately I knew this is what I needed! I was hesitant to download the free version as an extension for my browser at first because I was afraid that it may slow down my WordPress editor online. Anyway, if it slows down my browser, I can uninstall it anytime. So I give it a go and downloaded it. To download the extension is very simple, just fill in the detail to create a free account. Once installed, you can see a Green Grammarly icon at the lower right-hand corner of every editor box you use from now on. I began typing a paragraph of words as I would do normally. To my surprise, the extension did not slow down my browser at all. So it passed my first requirement, it did not slow down my online work. What is Grammarly? 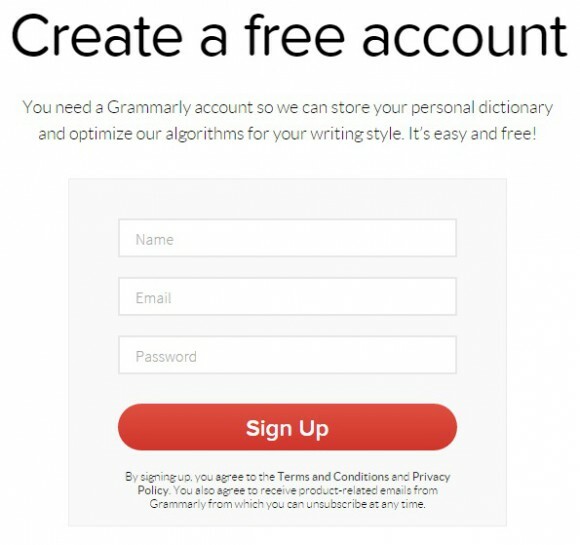 – How Grammarly Free Online Version Works? 1. Grammarly will remember unique words that you have added to your dictionary. Once you hover to the spelling mistake, Grammarly will suggest all the possible correct spelling. If you think that the spelling is correct you can just add it to your dictionary by clicking the [Add to Dictionary]. Simple as that! 2. 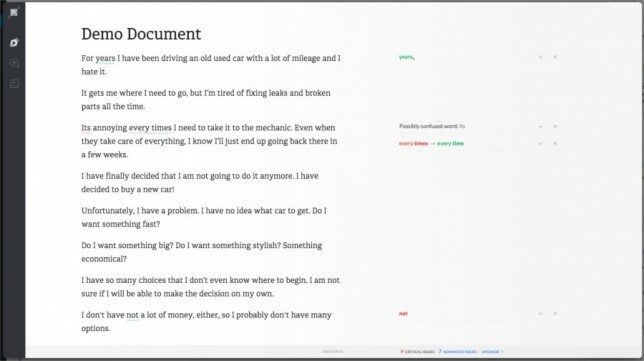 Use Grammarly’s document editor app to edit your full document all at once. When you hover your mouse on the little red circle at the lower right-hand corner of your editor, you’ll see this. The 7 Advanced issues are for Premium Version. (I’ll share with you more a little later). There are 9 Critical issues flagged out in my free version of Grammarly. When you hit the [Correct] button, you will be brought to a document app within your editor! You can view all the mistakes in one glance at the right-hand column and correct them individually. Once you are done, click the [back button] on the top left-hand corner and all your changes will be reflected in your editor. This is really an amazing feature! 3. Grammarly can keep track of the number of grammar and spelling mistakes you have made and corrected. 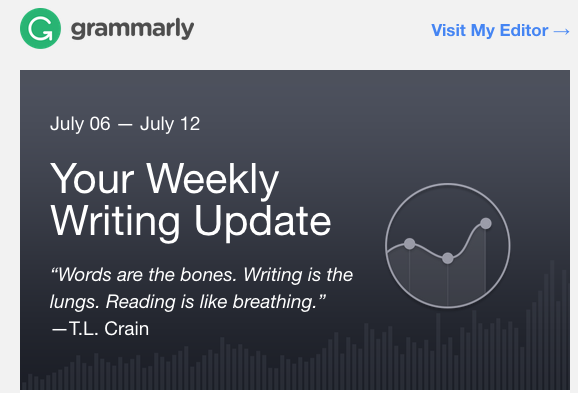 I am surprised to receive a Grammarly Insight email a few days ago. 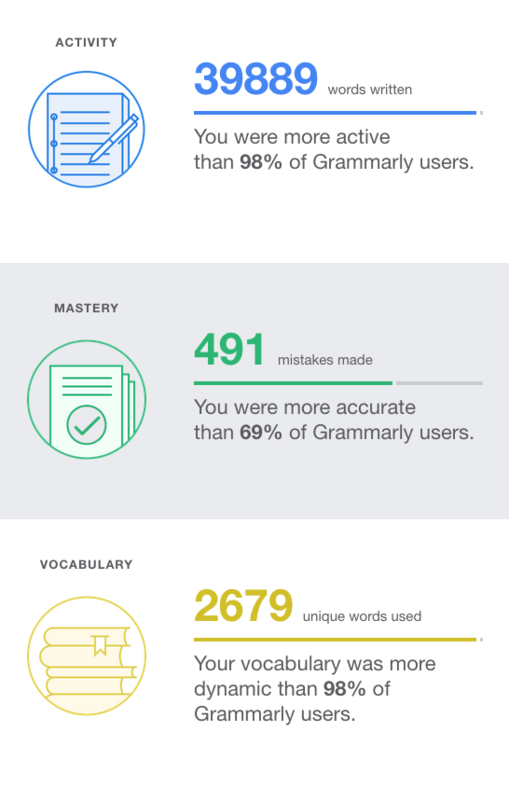 Grammarly has tracked my grammar and spelling mistakes that I have made over the past week! This information is quite interesting as I could know about my own writing skills compare to others. However, I do hope Grammarly would provide an privacy option for us to disable this tracking feature. What is Grammarly? – What else can Grammarly do? Of course, Grammarly can do the following for free too! What is Grammarly? – What does the Premium Version Offer? Let’s look at the comparison between Free and Premium benefits. Is it well worth to go premium? 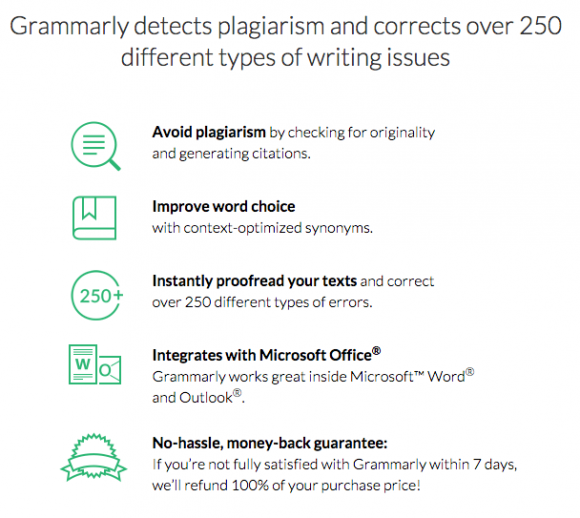 Grammarly will detect only 150 types of mistakes for the Free version. 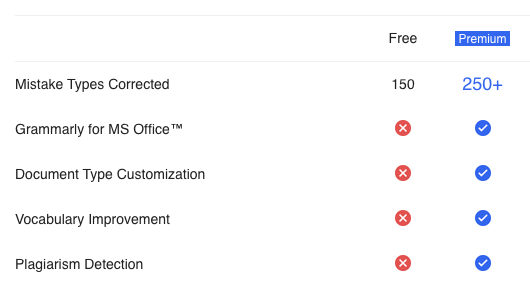 For Premium version, the number of mistakes type checked will increase to 250+ types. Another important feature of Premium Version is the ability to check for plagiarism, to prevent duplicate contents. This is important for search engine ranking, especially Google. Google will penalize for duplicate contents heavily. Personally, I am using the free version of Grammarly for my blogging usage as of now. I will update this section with more detail information on Premium Version in future when I have the opportunity to use the Premium Version for more advance checks. I think it is a little expensive on a monthly basis for new Online Business owners who are just starting out. It is quite affordable over the long term plan for all the additional features though. However, you have to look into your Online Business needs and decide which plan is most suitable for you. I am giving 4.0 stars because of the ease of use and the amazing Grammarly Document app that comes with it. Grammar and Spelling checks are pretty decent for the Free version. It would be better if we have the option to turn off the tracking feature for the weekly insight. Premium Version is definitely more worth the money for the yearly plan with all the added features. But you have to decide whether it suits your Online Business needs. With all these Premium features, I would say Grammarly could be one of the best free grammar checker tools online. Have you have used Grammarly Free or Premium version before? What do you think of it? Please feel free to comment below. Home business for stay at home moms – Shocking! ← BeOnPush Review – Legitimate or Scam?!? Shocking! Wow. this is a great tool for article and essay writings! You know most of us hardly care about the spelling of words or grammar when writing up an article or essay. Sometimes we aren’t even sure o the spelling of the word. It refreshing to know there is a tool out there that can help do the grammar and spelling check for you. Grammarly definitely will make essay and articles writing very convenient and easy. Thanks for sharing this info, Edmund! Hi Fidel, you are most welcome! Grammarly’s award-winning features have already helped many individuals and businesses. Essays for school work, documents for business presentation and even for article writing for Online Business owner like myself! Give it a try and you’ll be amazed! Wishing you the best! Thank you for sharing this amazing information and I will head over to Grammarly to try the Free version! Hi Nadeem, thanks for your comment and feedback on my site. I hope you like the Free version of Grammarly. Do head back here to share with us your thought about the free grammar checker tool online. Thank you, Edmund. That’s indeed a helpful review of a product I had heard about, but never explored. Since I do virtually all my writing in MS Word and SpellCheck corrects my typing errors, I guess the free version wouldn’t do me much good. And the paid version is way out of my price range. Otherwise I’d give it a try. It’s pretty amazing that it can even detect plagiarism; it must have an amazing database and lots of computing power behind it. I appreciate your honest comment and I understand that you do virtually all your writing in MS Word. I used to copy and paste my writing to MS Words for grammar and spelling check, but not anymore now because I can just type in my WordPress Editor and Grammarly will point out my mistakes on the go. I guess the advantage for me is that I do not need to copy, paste and edit steps anymore. Even while typing this reply to you, Grammarly has checked my grammar and spelling mistakes on the spot. I did notice that the Grammarly’s Free version did point out some grammar mistakes that MS Words did not detect at all. I guess Grammarly could have invested more on the computing power of grammar mistakes because grammar is its speciality. Give the Free version a try, if you do not like it, you could uninstall it anytime. Thanks for this great article, i love the tittle,’Better Writing Made Easy’. Have not heard of grammarly before now. From your article, a very good resource material for people like me whose mother language is not English, which is foreign to most countries in the world. Think, will sign up for the free version for a start, it has great potential of adding value to our articles.All the best ,God bless you. Hi Richard, thanks for your comment! My mother language is Mandarin and I do have difficulty with grammar in English like many people whose mother language is not English too. Grammarly has helped me a lot in my grammar while writing English articles, even though I am just using its Free version. I sincerely do think it will help others like me too. Do let us know how you think of Grammarly after you tried it, we would love to hear from your review too. Wishing you the best and God bless you too! Hey Edmund, I must first commend you on your website design, it is well prepared. I just have to thank you for introducing me to Grammarly. It is a relief to find my own personal proofreading tool as I get quite a few comments from people over my spelling & grammar mistakes. Hi Hamilton, thank you for your feedback and comment. I am glad that you found Grammarly here. Grammarly will definitely help you as much as it has helped me. I saved a lot of time spending on correcting my grammar and spelling mistakes after I wrote my articles. Hi Edmund, thank you for the article it was really helpful. Grammarly is pretty useful, any online marketer, freelance writer, people blog posting and any student would like to have it. I know that many people are paying others just for proofreading their materials. Do you use the premium version? How have been your experience with it? Can I stop paying when I want? Hi Franchesca, thank you for your comment and questions. Grammarly is definitely very useful for all these people you have mentioned. Even better, you could use the free version! I am currently using the free version and I feel that it is sufficient for me. The experience so far is so good and as described in my review. If you wish to use the premium version, you could terminate any time you want. Please check with Grammarly’s terms regarding the refund policies before you terminate. I use Grammarly to help streamline my proofreading process on my website. It make things a lot easier and helps me spot typos that I may have overlooked. The only issue with this type of software is that it’s far from perfect. Issued will still be missed, and I use extra free software to spot things that Grammarly won’t find. Thanks for sharing your experience with Grammarly. 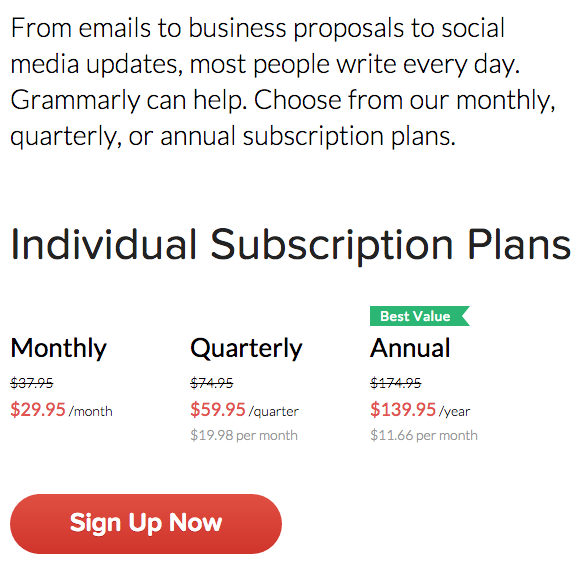 Yup, the premium version of Grammarly will have more checks than the free version one. Could you share with us what extra free software are you using currently? To be honest with you I didn’t realize how bad my grammar had got since I left school….and started writing blog posts!!!! I am with you, grammar is never my strong point even in school. Before I use Grammarly, I spent a lot of time doing grammar and spell check after every article I wrote using Words processor. Now I can check my grammar and spelling very much on the go while I am typing anywhere online. No, it did not even slow down my browser. (I am using Chrome) Try it! you’ll be impressed! Hi Edmund, I tried to download the Grammarly software and I realized it was a browser download!!! Nothing personal, but I’ve had a lot of problems with this sort of thing in the past. Can I ask how it’s going with the software? Has it slowed down your PC in any way? Yup, I mentioned in my review that it is a browser extension, Chris. If you read my answer to your previous comment, I mentioned that Grammarly did not slow down my Chrome browser. I guess we had the same experience in the past, but, nope, Grammarly did not slow down my work at all. In fact, it saved me a lot of editing time for grammar and spelling checks. You could just uninstall it if you do not like it. I have not heard of Grammarly before. What an interesting app. Your post is very informative, and shows just how easy using the program is. It’s good to know that it doesn’t slow down your computer in any way. I am curious to know how the paid premium version compares to the free version. Thanks for the great review! Hi Ben, you are most welcome. At the moment, I am using the free Grammarly version which is quite sufficient for me, thus I have not tried the premium version. I will update this post in future if I have the chance to use the paid version. I have been wondering about Grammarly for a very long time. I always thought it was a paid tool so I never really used it due to budget restriction. I particularly like the part where they suggest synonyms for you because sometimes, my brain is totally out of words when I have been writing for days. I am currently using Ginger for proofreading and they don’t offer the synonym feature. So I will be checking out this tool. Thanks for the review! Hi, Cathy! You are most welcome! Yup, until now, I am still using the free version and I feel that it is currently sufficient for me. Hope Grammarly will help you to find new words when you need it from now on. This is a complete review of the Grammarly. I am impressed with this article and it is my fav. I am using the Grammarly proofreading tool and I am a premium member. So, I can get a full-fledged scan on my blog articles in quick time. 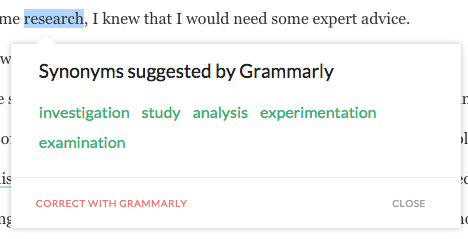 I don’t need to tell more about Grammarly if you have tried it. You can instantly buy the premium membership… Thanks mate for sharing an excellent post to your blog readers. Thank you for sharing your personal experience of using Grammarly with us too! I didn’t know about that there is another software that can do the same trick as Microsoft words. I always use Word to write my posts, but it often cannot pick up the mistakes and grammar error. I guess I should give this a try. It’s quite pricey, though. Do you think with the free version, it’s good enough? Thanks for sharing this information with us. Yup, the free version is good enough for my use currently. Do give it a try and see if it helps you better and save you more time. Because you do not need to copy and paste from Microsoft words to your WordPress. Wow, what an amazing article. I am also using Grammarly and I agree completely with you about this amazing app. I think the free version is plenty good for a business starter. This app really saved me time and effort as I can check my grammar and spelling on the go. Btw, I also tour around your website and you are doing a wonderful job with this website! Where did you learn how to build a website like this? Hi vhuynh01! Thanks for your comment and compliment to my website. Yup, Grammarly helped save my time and effort too. Highly recommended for anyone who’s grammar and spelling needs constant checking on the go. If you are interested in learning how to build a Website, I highly recommend Wealthy Affiliate’s free* Online Entrepreneur Certification Programm (Level 1). It teaches you all the fundamentals of setting up a website and I am sure you’ll be amazed at the information there. I always have spelling errors no matter how good my command of a certain language is. Sometimes I type the way I speak and that alone contains a lot of grammar and spelling mistakes I didn’t even know of. Grammarly sounds really awesome and I’ve heard good things about it. Definitely giving it a try, thanks for taking the time to write this very detailed review! Just out of curiosity, does it work with any other languages too? I’m thinking of creating another blog in a different language and this could help out a lot. This is a great review and I agree with your article. Although there are many grammar checker tools to use out there, I too recommend Grammarly because it is the best. Hi Leah, thanks for your comment and acknowledging Grammarly is the best!